Nestled amongst a secluded tree covered compound, just steps from the famous Historic Santa Fe Plaza, with museums, galleries, shops and restaurants just outside our door, Las Palomas is a refuge like no other in our magical city. Las Palomas embodies the charm, elegance and ambiance which makes Santa Fe such a unique and special place. This property offers a variety of different types and sizes of accommodations to suit every need. All offer wood burning or gas fireplaces, king beds and kitchenettes, while the condos (from 1-3 bedrooms) feature full kitchens and spacious living areas. Las Palomas serves a complimentary deluxe continental breakfast every morning. Guests will also appreciate the on-site fitness center. After a busy day, guests can pamper themselves with a spa treatment at the sister property, Hotel Santa Fe. A free shuttle service within just under 1 mile is provided. 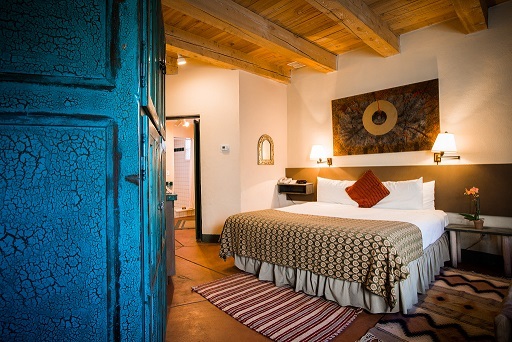 Located in Downtown Santa Fe, this romantic hotel is within a 10-minute walk of Santuario De Nuestra Senora de Guadalupe and Palace of the Governors. San Miguel Mission and New Mexico State Capitol are also within 1 mi (2 km).